Wakiso District Council has endorsed the controversial sand mining in Lake Victoria by Mango Tree, a Chinese company, despite opposition from the district chairman, NEMA and other environmentalists. Over the last month, NEMA and Mango Tree have clashed over dredging in Lake Victoria. While the environmental body argues that the practice will have serious ecological consequences, the Chinese company says dredging will only create underwater ways for ships, which they are manufacturing. But the district council on Tuesday endorsed the dredging in Lake Victoria. 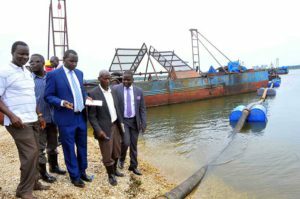 According to the speaker, Mr Simon Nsubuga, the district natural resources committee established that dredging has no significant negative effect on the environment. Mr Nsubuga said the district sector committee recommended that dredging by Mango Tree should be done under close supervision by NEMA. The district council has been split over sand dredging by the Chinese firm. Last month, the district chairman, Mr Matia Bwanika Lwanga, accused the councillors of receiving bribes from the coordinator of the Operation Wealth Creation programme, Gen Salim Saleh, so as to support the Chinese company’s activities on the lake. In response, the councillors led by the speaker threatened to impeach him over the matter, saying sand mining was a big source of the revenue for the cash strapped district. Last month, Gen Saleh attended a Mango Tree event and said sand mining was a raw material for factories and no one would stop the Chinese to extract sand from the lake. However last week, NEMA said Mango Tree Group Ltd was only granted the licence to manufacture ships and not sand extraction. “We want to categorically state that Mango Tree Group Ltd’s activities of engaging in sand mining are illegal. We only cleared them [Mango Tree Group Ltd] to manufacture ships after they secured a license from the Uganda Investment Authority, not carrying out dredging on the lake shores,” said Ms Naomi Karekaho, the Nema spokesperson. “The sites where they want to excavate sand are very crucial. We warned them against tampering with them because any destruction may spark off a serious ecological disaster we may not handle as a country,” she added.